We're entering year four of our vegetable gardening adventure. Though there are lessons learned each year, perhaps the biggest lesson is that each season is unpredictable. Last year, the weather and stinkbugs took their toll on our previously successful tomatoes. Squash was once again a disaster. Potatoes prevailed, as did carrots, radishes, cucumbers, jalapeno peppers, and to some extent, beans. Herbs, planted as much for beneficial pollinator and sensory satisfaction as for culinary delight, were a huge hit. While we like to go with what works, it's hard to resist trying something new every year. Additionally, as Juniorette gets older and is more able to participate in gardening, our focus shifts toward finding colorful, funky, adventurous plants that are delightful to both grow and eat. Now it's February, and we have decisions to make. We have lots of seeds left over from previous years. 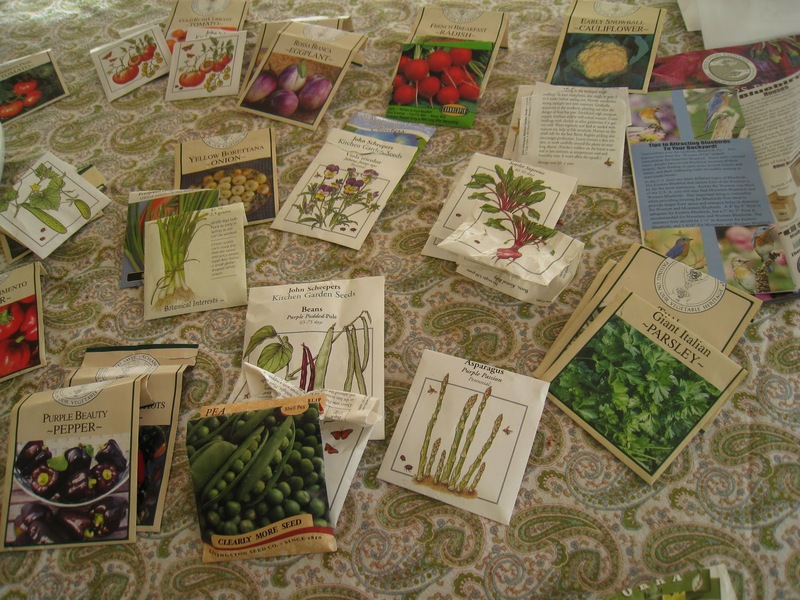 Buying new seeds for a small space gets expensive and can seem wasteful. On the other hand, who can resist Dragon's Tongue beans (below), dragon carrots, or Aurora pepper just to name a few? My goals this year are to: build an asparagus bed, add more edible flowers and herbs, and create an ornamental edible area in our perennially underutilized patio raised bed. Before launching into an all-new set of seeds, we inventoried our collection. Many of the seeds are three years old and have reached their "sell-by" date. However, recent research shows that seeds kept in cool conditions can last up to a decade or more. Since we store our seeds in the refrigerator, I thought there'd be a good chance that many of them would germinate. Before throwing caution to the wind and risking a wasted seed-starting season, we did a germination test. We rolled a few of each of the seeds we want to plant in a wet paper towel, sealed them up in ziploc bags and put them under grow lights. To our delight, all of seeds germinated within a week. This means less to buy, right? Well, yes and no. This year, we'll try Heritage Farm's Lemon Drop tomato and Amish Paste tomato, Blue-podded pole beans, ornamental peppers, Armenian cucumbers, Dragon carrots, a beautiful Red Burgundy okra and Aunt Molly's ground cherries. We'll skip the squash, since it just doesn't work, and 2/3 of us don't eat it anyway. We'll also make the garden even more kid friendly by planting bean teepees, sunflowers, edible borage and nasturtium, and of course, a butterfly garden. I save all my leftover seeds of previous years in the fridge, too. It's my fourth year gardening, and all the seeds still sprout. But that doesn't stop me from buying new seed, as I always want to try something new as well! Yum. When do you open your farmer's market? Open year round for friends and family. Stop on by!